FACT #1: The shortage of diverse donors costs lives. 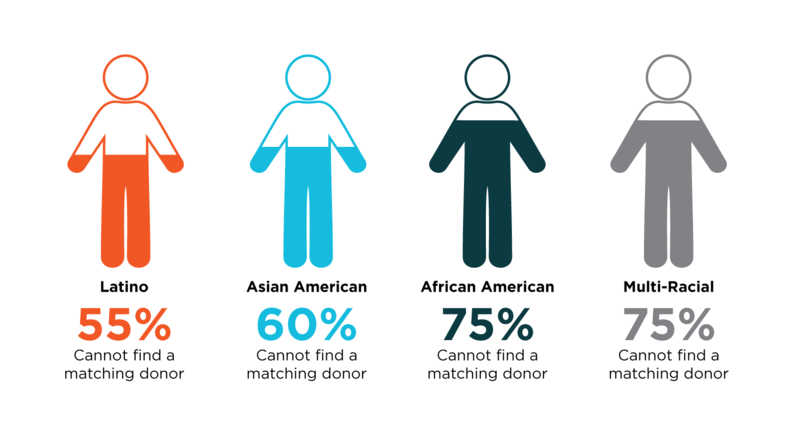 The numbers are shocking: 75% of Blacks, 75% of multi-racial/hapa individuals, 55% of Latinos and Hispanics, and 60% of Asian Americans do not have a perfectly matched donor in the worldwide registry. The reason matches are so difficult to find for these patients is simple: their genetic heritage is underrepresented in the registry, which means people sharing a similar lineage or ethnicity have not joined the registry in sufficient numbers. For example, while more than 12% of the American population is Black, only 4% of Americans on the international registry are Black, and the percentages are similarly out of proportion for others. Gift of Life is on a mission to change these numbers. Our goal is for every person to find their perfect donor when one is needed. But to get there, we need more people to step up, join the registry, and commit to help save someone’s life if called as a match. Bone marrow and stem cell transplants are one-to-one: one donor is a tissue type match for one patient and donates to that person. The factors we test to make sure the donor and recipient are a match and the transplant can work are called Human Leukocyte Antigens (HLA). You get half your HLA from your mother and half from your father. The best chance of finding a perfect HLA match is with someone of the same ethnicity. Looking at who your ancestors were generations ago can give transplant doctors hints about who might be your perfect match today. When a population of people is geographically isolated, or intermarries within the same group for many generations, naturally occurring HLA mutations stay within that group. Today people disperse freely around the world, but you carry the HLA from your ancestors within you, and finding a perfect HLA match means finding another person who shares your ethnicity. Multi-racial/hapa individuals often have rare combinations of antigens in their HLA profiles, making it even more difficult to locate perfect matches. It is urgent that more multi-racial individuals join the registry. We know we can change these statistics, because Gift of Life has already done it. In 1991, a young man newly diagnosed with leukemia was told he had no hope of finding a matching donor because he was an Ashkenazi Jew. He only had a 5% chance of finding a lifesaving match, so doctors told him to do what he could with the short time he had left. That man was Jay Feinberg, founder of Gift of Life. His parents and friends refused to accept that the marrow registry was not diverse enough to help Jay. They started a grassroots effort to find his donor, a four-year search that added more than 60,000 Jewish donors to the registry, and saved dozens of lives. Jay did get his transplant and went on to found Gift of Life Marrow Registry. We believe that every patient should be able to find a donor at the time one is needed. In partnership with other organizations around the world, Gift of Life helped recruit so many donors that today’s chance of a Jewish patient finding a donor is 75%. Gift of Life helped change the odds for Jewish patients, and we are determined to do it for every other ethnic group. But that can’t happen without your help. There are two ways to donate to a patient – peripheral blood stem cells (PBSC) or bone marrow. More than 80% of transplant requests are for peripheral blood stem cells. Blood is drawn from one arm, then an apheresis machine separates out the stem cells needed for transplant, and the remaining blood returns to the donor through the other arm. The process takes 4 to 6 hours, and donors can watch a movie, nap, or talk with friends while donating. Less than 20% of donations are bone marrow, usually requested for children. Bone marrow donation is an outpatient process that takes 1 to 2 hours. While the donor is under general anesthesia, the doctor collects marrow with a syringe from the hipbone. No bone is removed and no stitches are needed. Stem cells and bone marrow regenerate naturally. To learn more about the donation process, click here. FACT #5: You could save a life and become a hero – this is your best chance! Let’s face it, your chances of being bitten by a radioactive spider and gaining super powers are pretty slim. But that doesn’t mean you can’t save someone’s life! About one in every 1,000 donors on the registry will someday be called as a possible match for a patient. Some of those called will turn out to be the best possible match, and will get that miraculous opportunity to save someone’s life. All you have to do to join the registry is give a simple cheek swab and complete a health questionnaire. Help us give more people a second chance at life: order your swab kit now and join the registry. If you would like to run a donor recruitment drive in your workplace, community, place of worship or educational institution, please contact Gift of Life at 561-982-2900. We provide all the supplies and training you need to spread the word and help us bring new donors into the registry.